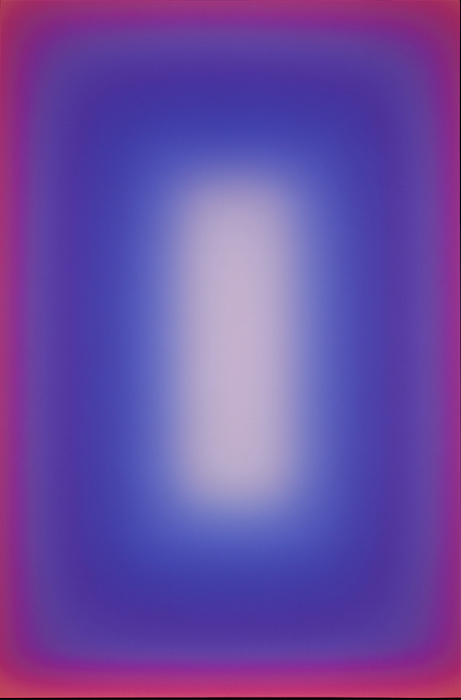 James Turrell, 'West Façade Illumination' (2015), image courtesy of the artist and Houghton Hall. Photo: Hugo Glendinning. It is a pleasure too rarely realised to venture to the end of the line, and then beyond. The midweek, early afternoon train out, north and east, towards the sea, of course. Buses at Kings Lynn, but it is not hard to imagine older coaches, carts, a raggle taggle wander into fields. Into England – the story of England; England’s imagining of itself, the green dream of the high season. Through the lanes – a benign maze, and past open gates into the estate’s perimeter pastures, white deer threading the dapple, reclining in small groups beneath the huge and ancient trees, their great canopies cropped sharply on the grounding edge about a man’s height from the grass, so it seems they almost are suspended, trunks dissolved in the haze, vast sails of leaves above the landscaped reach of summer. The measure and the spur: Houghton Hall is no default siting, rather a primary location, in ways far more endowed than its founding owner Robert Walpole (Britain’s first prime minister) could have imagined. Laid out on an East / West axis, the building commits itself to time as much as it does to place; one eye on the past, the other for what might come; an alignment of the sun’s passage and of the history of art from west to east and back again. Now Lord Cholmondeley, the amicable current owner, has called down to art’s furthest coastal frontier, to the Golden State itself, to the very idea of frontiers, of the expansion west, the threshold reached – and crossed. This is an undertaking driven by friendship – from earlier acquisition, through construction, alteration and on to years of planning, building a case for a landscape of light, terrain transformed. I admire Borobudur, Angkor Wat, Pagan, Machu Picchu, the Mayan pyramids, the Egyptian pyramids, Herodium, Old Sarum, Newgrange and the Maes Howe. These places and structures have certainly influenced my thinking. 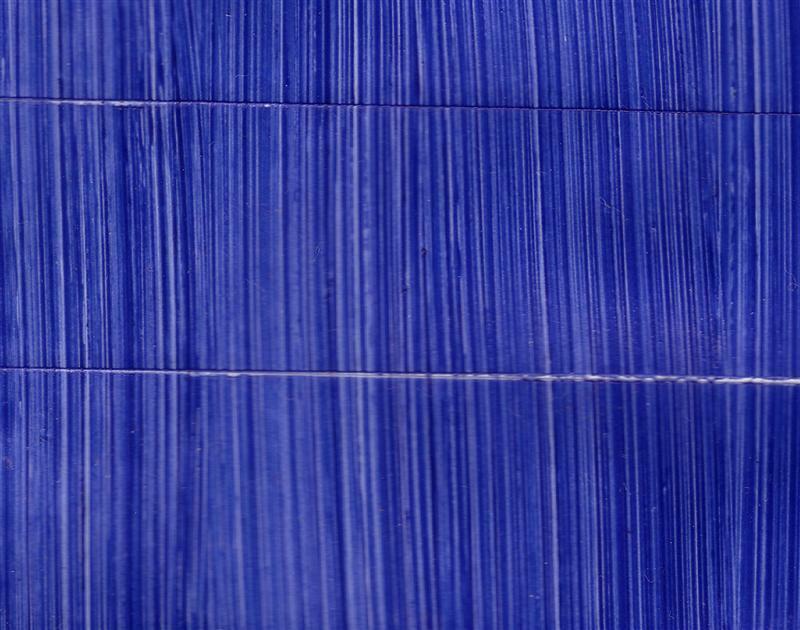 He shares correspondences and purpose, the excitement of work discovered outside of cities, the need and rewards of the quest, for artist and audience. Instead of gardening and bird-watching I do this. But he likes gardens, follies; caves, grottoes, work for domestic space. Our eyes not made for noonday sun but far more for twilight (the leaving of light), for hunting, for the gathering around flames. The American artist of painted desert distances, whose shifting of vast volumes of earth to create a remarkable reception hall in a volcanic crater for the encounter with cosmic light – with what cannot be held, only perceived – is not, we see, so far removed from landscape gardening, the geometric architectures of the classical English countryside. Both realise worlds within the world; the footprint of both is far larger even than their actual area (histories, forces, resources bought in from well beyond the walls of rock or brick). But both are, necessarily, vessels for creation and reflection. Both build slowly, over seasons, years, decades, and invest proportion and relation in all consideration. Both work with multi-sensory deployments of vista, of concealment, retrieval and the revealed. Both are essential in intention and delight in imaginative excess, first of all in the simple fact of thinking even to start. 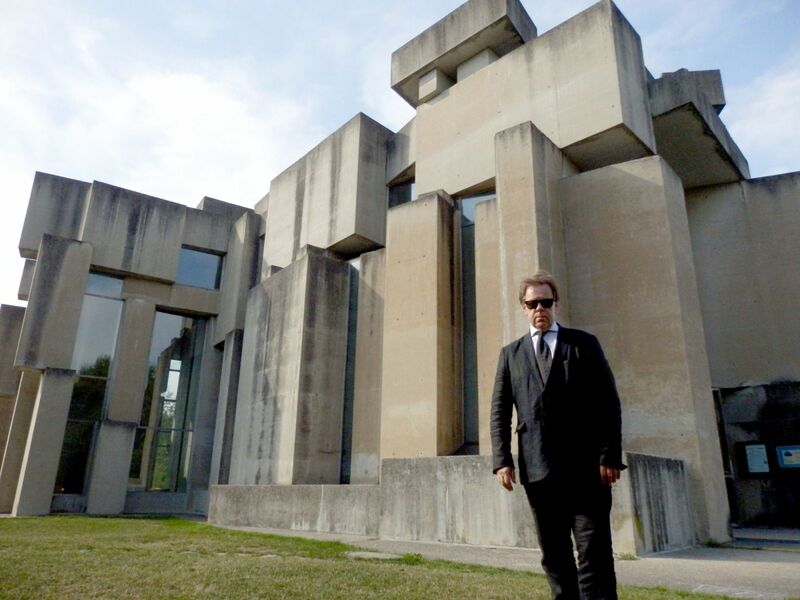 Both make powerful ideas manifest in matter; both work with light, space and time (as well as its human working in history – geological, natural, architectural and social) as the triptych of priorities for the construction of place. Both are engines of desire – and its realisation. Light feeds us, he says. We are given a map, a light projection really. Trace a line between the points and you have a constellation come to earth. And so we embark, in pairs, in small groups, some solitary. What might be the sequence to choose, the one that, selected, unlocks an enlightenment. The garden breathes gently, an ideal breeze, birds invisible in the formal hedges, the soft, steady saw coo of wood pigeons. We disappear among the topiary, down the lined avenues, past the statues, find ourselves drifting through the fertile quarters of the immaculate walled garden and its lilac corridors, its beds of startling irises (never brighter or more open, suitably). Six artworks by others have also come to rest here: Rachel Whiteread’s cast hut; the marble of Stephen Cox’s woodland-based Interior Space and Flask II; Zhan Wang’s giant stainless steel ‘Scholar’s Rock’ for garden contemplation. But three in particular seem to set us on our course, potent prefaces to the visit’s leading reason: first, Jeppe Hein’s elemental ‘Waterflame’, a burning fountain in a cool pool among the planting; then the Cornish slate groundwork of Richard Long’s ‘Full Moon Circle’, a way-marking out towards the western front’s horizon, shifting from dark pool to sundial of gold in the June afternoon, as we and the day lengthen. Meanwhile, Anya Gallacio’s sinuous ‘Sybil Hedge’, double kin to its surroundings, grown following the signature of the Marquis’ late mother, rustles just off the path. This is the furthest out, and permanent. It is the measure, less an artwork than a way of being in the world; a genuine shaping of the mystery of the senses. They say writing about music is like dancing about architecture. Both of these tasks fade before the challenge of trying to describe the experience of this astonishing space, the ground floor of an 18th century water tower, dressed up as a folly in the parkland. Furthermore, it is not my intention to anticipate – and undermine – the startle of first meeting; rather, the opposite, to advocate for the need to do just this. I am concerned with the revelation of the light itself, rather than what it reveals. 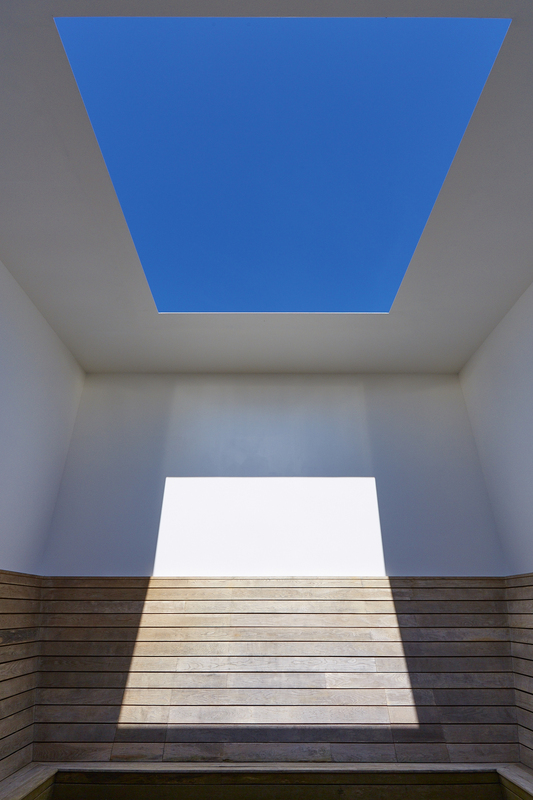 What is so remarkable about James Turrell’s work is that, while incorporating a myriad of architectural, historical, metaphysical, scientific and aesthetic informants and dialogues, the pieces (encounters perhaps is more accurate here) only, finally and triumphantly, mean themselves. They are, beyond all argument, for or counter. Both process and ever-evolving arrival, form and function, they declare presence as the foundation of perception and reception, and the spiritual as a transforming outcome of this acute meeting with the possibilities revealed by such acutely realised perception. Being and becoming, cycle and change; what might be well-meant platitudes on paper or another medium become undeniable declarations of inevitable fact when the intention and realisation of the art is delivered through perception directly, brush and paint and image. My work is about space and the light that inhabits it. It is about how you can confront that space and plumb it. It is about your seeing, like the wordless thought that comes from looking into a fire. A raised, turning wooden path climbs around the sides of the wooden, stilted structure at its centre, until the aperture is reached. We step into a meeting room some metres square, benched around its walls; the central floor is open to the sky. The edges are thin-roofed but calibrated in relation to the spectrum shifts that skylight will afford in the course of day and night. Framing is all. Meanwhile, Asian architectural traditions (clarity of line, wood, detailing) assist a far older child-like passion for sky-gazing. The shadows of higher branches just beyond flicker in a panel of sun across one wall. A single bird traverses. It is the still heart of the afternoon. Perhaps four of us are present. We sit. And breathe. And sit. And look. We sit. We become inescapably aware of being on earth, of the planet as a vessel in the sea of space. Still, we travel with it, its passengers. This is where we live. We read the sky for signs, the closest now we get to ocean-crossing and its needs. The blue of the afternoon becomes solid, a ceiling: the privilege of perception, gifting us all this. The space collects sky, is an entrance to the sky, offers the first and final roof – of sky. Light has no history, except for us in its journey – it is itself always and at any point, is only utterly present. History, the ability to reflect from just outside the sensual present tense of experience, comes in the granted space between perception and reception, both to the eye or ear, or in the caught light of a photograph or film. Later we shall return, the group entire, a chorus of eyes, in the twilight, entre chien et loup, as the French say (between dog and wolf). Skyspace will become starspace. Like Quakers (the faith of Turrell’s origins), we sit and wait, we speak, or not. We are. 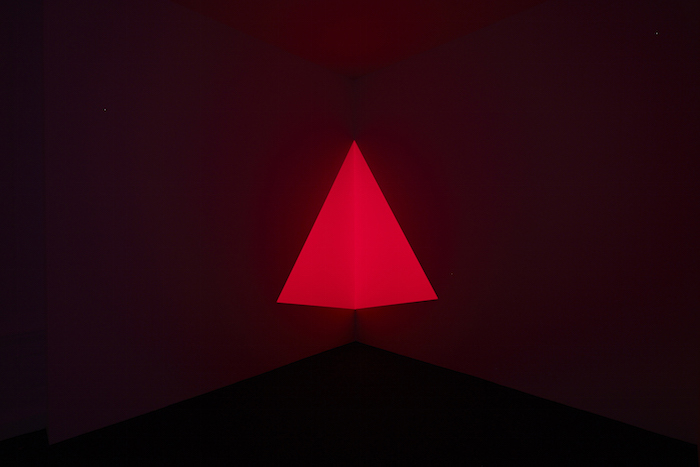 James Turrell’s transformative works involve the remaking of actual zones through the harnessing of light. All his pieces do that, of course, by altering the perceptual balance of the locations they occupy, but those that create a depth-charge of psychic shift achieve this effect because the relationship of elements – hue, intensity, duration, scale (of space and light) – is such that the outcome appears inevitable, or more; that it feels like the latent intention of the site, only now made manifest. No work displays this more keenly than his Roden Crater (models, prints and photographs of which are situated in the main hall’s ground floor rooms, along with reflection holograms, projection pieces and the tall glass of Shirim, and, taken together, covering more than 45 years of enquiry). Even the homepage screen of the dedicated website for this life-work constantly changes hue and tone. But the crater is only the largest example of the fascinating tension that threads all Turrell’s works into a single project – that light, while undeniably matter, albeit without a manageable solidity to the hand, achieves a viable presence under Turrell’s stewardship, and that this is achieved through a palpable and potent relationship with matter (the Arizona landmass, not least). 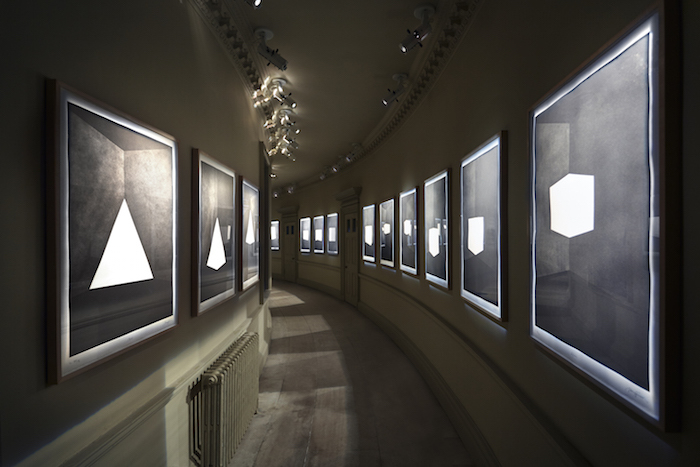 In the long English light of late afternoon, as shadows stretched in through the open doors of the house and lay down like quiet hounds across the old flagstones and floorbeams, we moved from space to space – from the domestic halls and corridors to the old kitchen storerooms and the stables of the yard, finding piece after piece by James Turrell: ‘Enzu’s lime green column; the hovering diamond of ‘Raethro Red’, the throbbing wall of ‘Raemar Magenta’ and the televisual concentration of ‘Tortoise Beats Hare’. All demanded extended attention. All changed the qualities of sound in the rooms they occupied. John Grierson, the father of documentary film, described the working of his genre as the ‘creative treatment of actuality’. The founders of cinema, the helpfully named Lumiere brothers, filmed a train entering a station and it changed reality for its viewers. It made a new reality. Cinema operates with space and time to make an image. It projects intangible, ungraspable imagination onto a wall and makes a door, a threshold visible, one across which we step into a fresh way of seeing and being, like burial workers emerging out of the dark tunnel of the ancient grassed mounds (in Orkney and Carnac…) into the lit stone door-space of the world. Always thresholds, always the meeting – and making – of worlds. 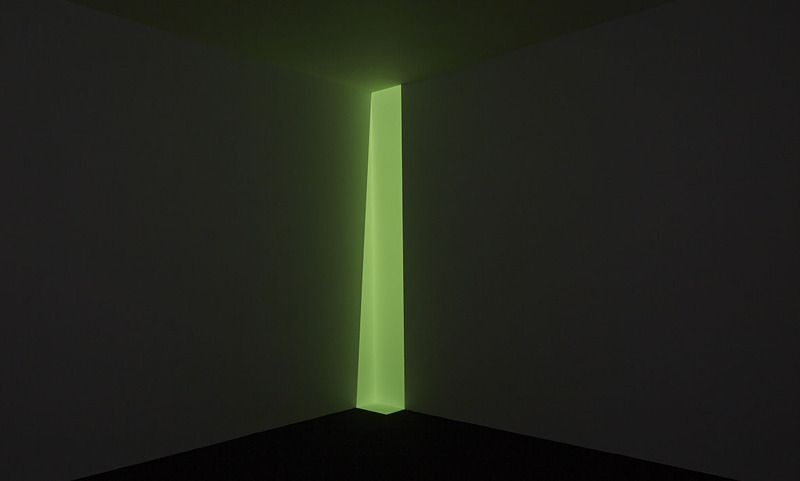 Along with all else, it now seems right to consider James Turrell one of our finest film-makers. The world comes out at night. A single owl. Sunset is a subtle fire in the foothills of the evening. Embers of cloud. The night economy is a light economy, in many regards more than day. Saturn, Jupiter, Venus. There. Things become multiple, identities no longer so singular; they both merge – soften into kinship – and seek their own distinction, a sharpening: the essential tree inked onto the cosmos; the fox’s keening; clarity and priority in darkness. Fire, shelter. Bats stringing the trees together with the flickering lanterns of their flight. extra-chronological defining of the moment. Architectural elements – the colonnade, pavilion, alcove windows, balconies, statues and cupolas – are given their own emphasis against the blue-black sky. Phenomenal surfaces and outlines; pulsing hues leading sight in to what now become depths. The ghost boughs of the managed woods lean in to the frame, and all beneath the pitched camp fires of long ashed constellations. The moon climbs like a poacher over the high perimeter wall. Towards midnight a hare tries the empty road. The sleeping lives of gateside lodges, scattered villages and towns. A human silence in the fields and forests. This surely is the time of favoured passage – a settling calm in the progress over land; past strange structures in angled silhouette; light stations, flatland registrations. This is not a landscape, any more, of night threats, of terror incursions into dreaming settlements. Closer to the city, the darkness in retreat; on the outskirts, in the business parks, on the concrete aprons, capital’s sheds and depots packing and dispatching, lorries leaving like messengers on horse in all directions with the news. Tomorrow’s purchase, goods and goods and goods. But we, on the night coach, in the place between mind and lunar light, are riders of reverie, our way signed by the benign perceptual after-burn of the day’s immersions. The moon is our travelling constant, very low over the dark crops, but harvest in its hue, gleaming wheat, and huge. Light is, and light makes it all. It does not reveal the real. It is reality. Turrell knows. And now we too do, a little. The driver, eyes ahead, drives on. 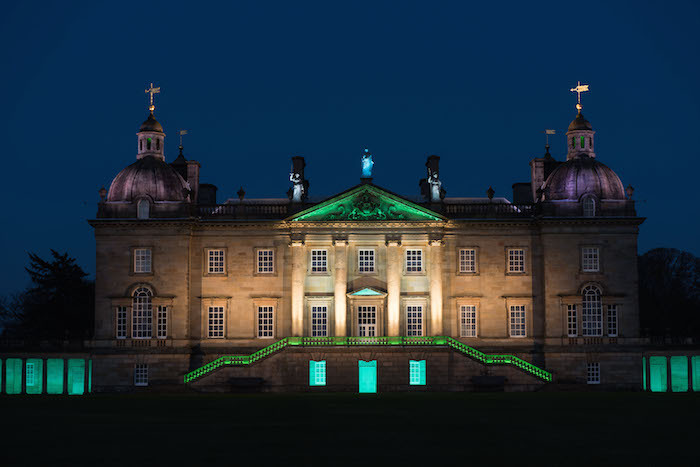 James Turrell: Lightscape continues at Houghton Hall until 24 October 2015.
is a writer, curator, presenter and producer. He is Film Curator at Whitechapel Gallery, London. This article is an online exclusive from September 2015.